Summer Breeze.The Acer Aspire TimelineX series is getting new hardware and a fresh new look. The 5830TG laptop, with a 15.6 inch display, is the spearhead of the new lineup. Thanks to its Nvidia GeForce GT 540M graphics chip, the laptop can also satisfy gamers. Does this mean that Acer has learnt from its mistakes and is ushering in a generation of new, improved notebooks? 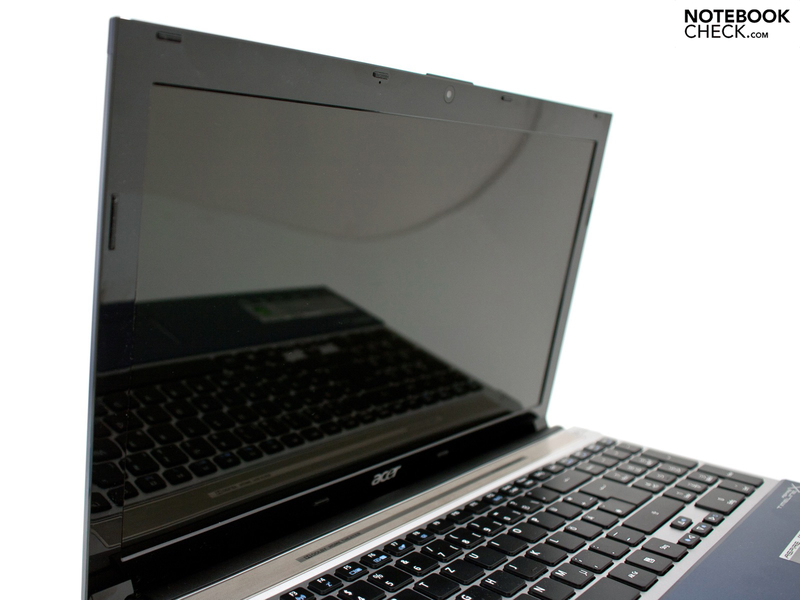 The new models of the Acer Aspire TimelineX series celebrated their debut at the CeBIT 2011 in Hannover. 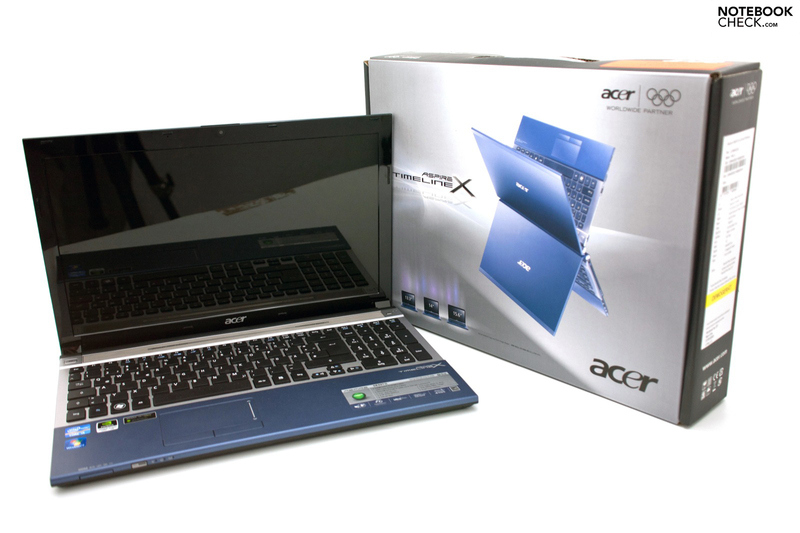 The latest generation has a new look, but overall Acer has remained faithful to the original design of the TimelineX series. 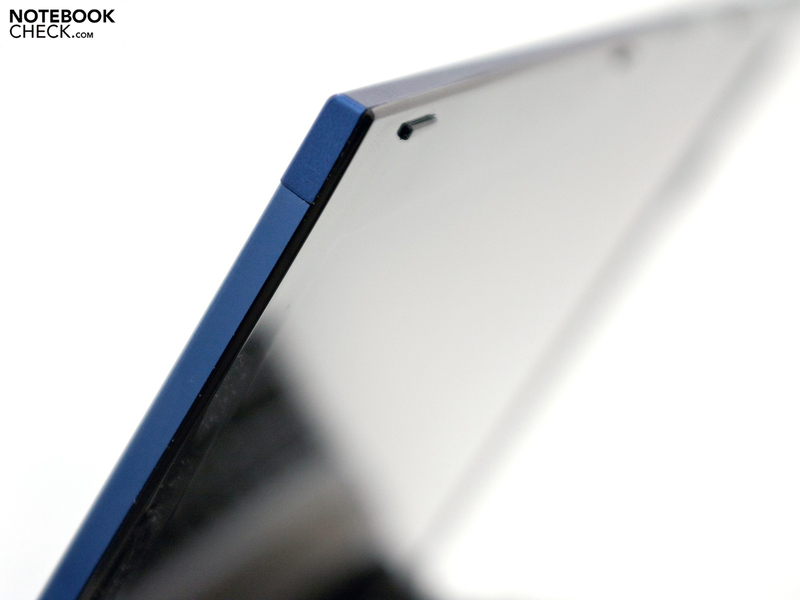 Some things have stayed the same, such as the matt case surface and aluminium display cover. New features include "isolation" keyboards, with chiclet keys. As accustomed, the laptops will be available in three display sizes: 13.3 (3830TG), 14 (4830TG) and 15.6 inches. 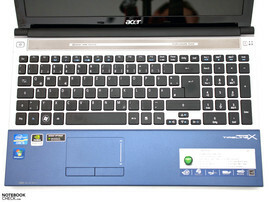 Overall, the new TimelineX generation looks very similar to the luxury models from the Acer Aspire Ethos series. We tested the Acer 5830TG, which has a 15.6 inch display, a native resolution of 1366 x 768 pixels and a glossy surface. Acer has picked out new hardware for its latest models. So the TimelineX series will now be equipped with the latest Intel Sandy Bridge CPUs. Our test model, the 5830TG, came equipped with a Intel Core i5-2410M (dual-core CPU with a clock speed of 2.3 GHz, which can be boosted up to 2.9 GHz using Turbo Boost 2.0). 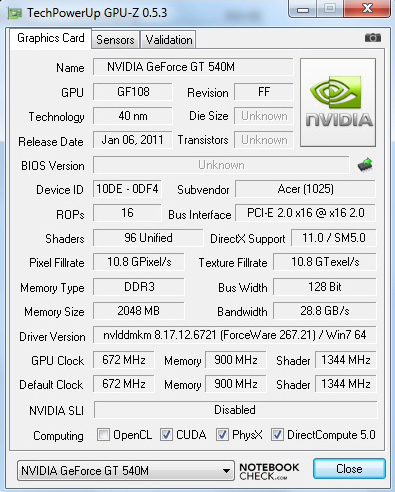 The CPU was further supported by the new middle-class graphics chip, the Nvidia GeForce GT 540M which has 2 GB DDR3 memory. Thanks to the big 6 cell battery, with 66 Wh, and Nvidia Optimus (which allows switching between the dedicated graphics chip and the CPU graphics chip), the battery life should be able to last for 8 hours or more. 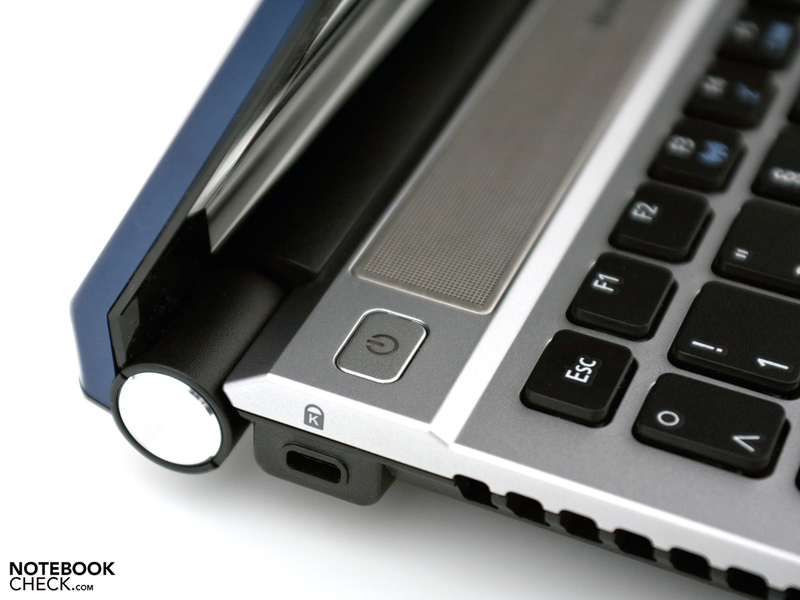 Note: the battery is integrated into the notebook and can not be removed directly. Our test model, the Acer Aspire TimelineX 5830TG-2414G75Mnbb, is also equipped with a 750 GB hard disk, 4 GB DDR3 RAM, USB 3.0 and the latest communication technology and cables. 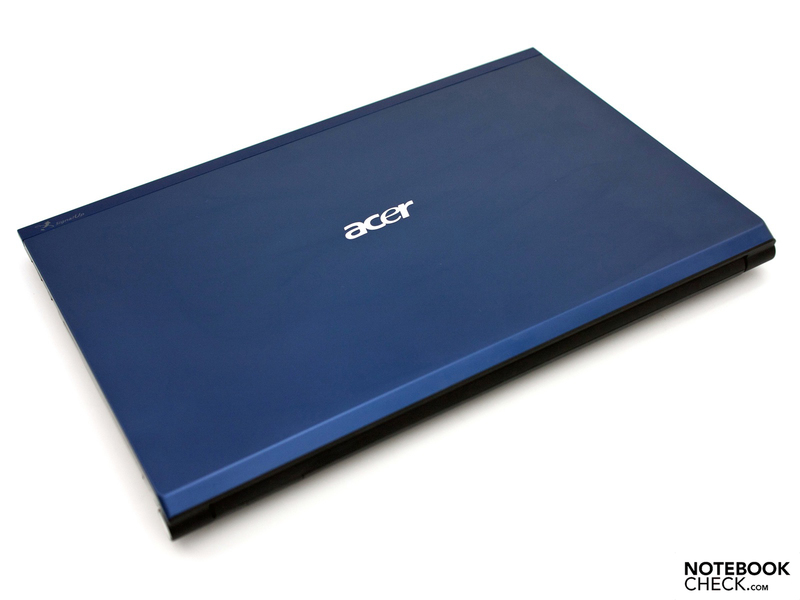 This mainstream configuration is offered by Acer for 899 Euro (recommended retail price); some distributors offer the notebook for 799 Euro and upwards. New hardware and a new look. The sturdiness of the optical drive is poor. „April showers bring May flowers“. This proverb is fitting for the case. The new design is true to the TimelineX look most users are accustomed to, but some elements have changed. The new colour combination, which has been dubbed "Ice-Blue", is a stylish combination of blue, silver and black case parts. The quality of the synthetic material used for the notebooks is enhanced by the matt case surface, and the aluminium display cover underlines the "Premium" aspiration of the new models. Fingerprints, dust, and scratches do not stand a chance on most of the case; only the shiny display border falls victim to these annoyances, and seems to have been taken directly from the predecessor 5820TG. In our opinion, a matt black look would have been much better. The sturdiness of the case left us with an overall good impression and the good workmanship of the used material is a plus point. Only one sharp corner in the display border ruins the otherwise good ensemble. The bigger and outwardly placed display hinges are a new feature. They hold the display stiffly in position. Sadly, there are still a few flaws: the case behind the display is not very sturdy (so pressing down on it may cause distortions to the displayed picture), the display is not held securely in position and moves slightly, and the user has to use both hands to open up the display. The screen allows itself to be opened up to 145 degrees, which is very good. The bottom case half is made of matt synthetic material and gives off a high-quality impression. There are various openings for ventilation and a few stickers. In addition, there is also a long service panel. Under this, the 2.5 inch hard disk and the 4 GB RAM (in two slots) is hidden. Sadly, the other components can not be accessed as easily. 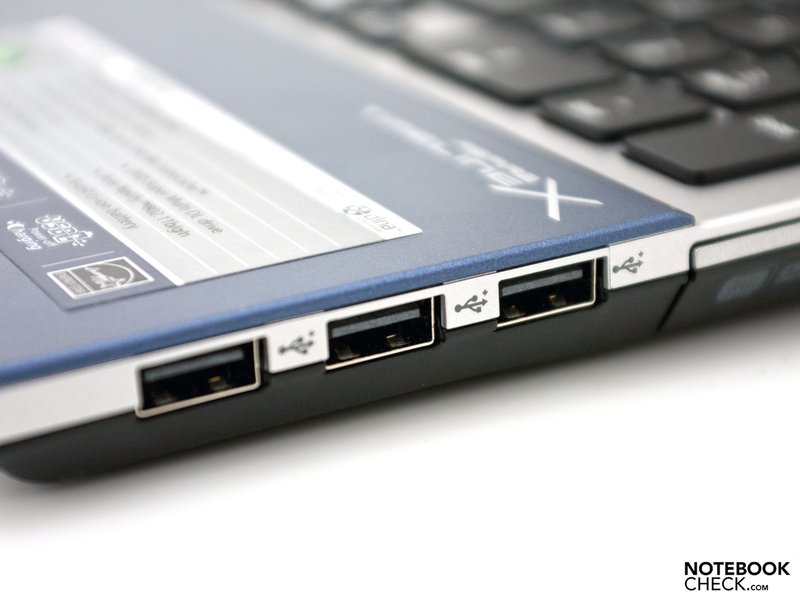 The ports offered on the laptop are placed on the right and left side. The offered connectivity has not changed much, though the ports have been upgraded to meet the latest standards. The old ports, such as VGA, three USB 2.0, RJ-45 and the audio jacks, including S/PDIF, are now offered alongside USB 3.0 and a HDMI output with 1.4a support (high speed with Ethernet, maximum 100 Mbit, 3D-ready). eSATA and an ExpressCard 34 slot are still missing. A nice new feature is the "Power-Off Charging" function which allows the user to recharge a peripheral device via the USB 3.0 port even when the laptop is off. The positioning of the offered ports seems poor considering everyday usage. 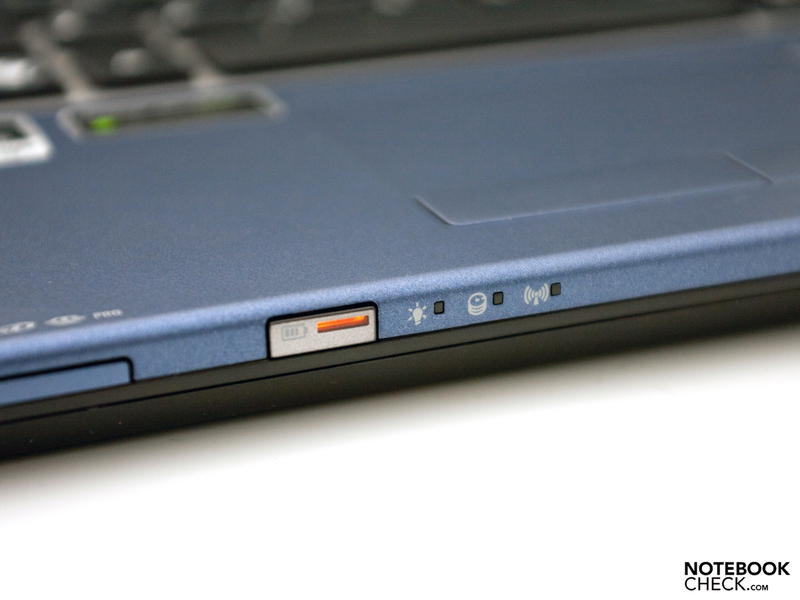 The positioning of the ports in the front of the laptop means that the user will soon be overwhelmed by a mess of cables, which will hinder the comfortable use of an external mouse. This problem exists for both right-handed and left-handed users. 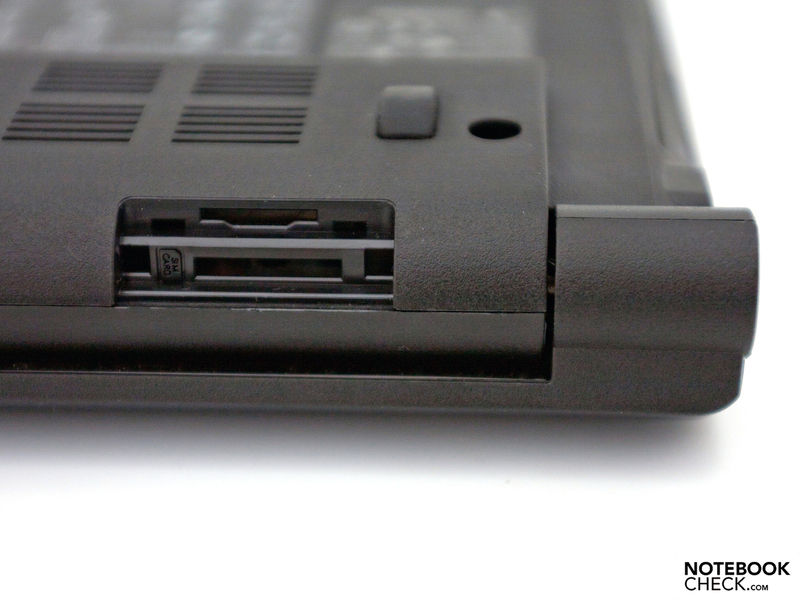 There are no ports placed on the back of the notebook due to the low sitting hinges. 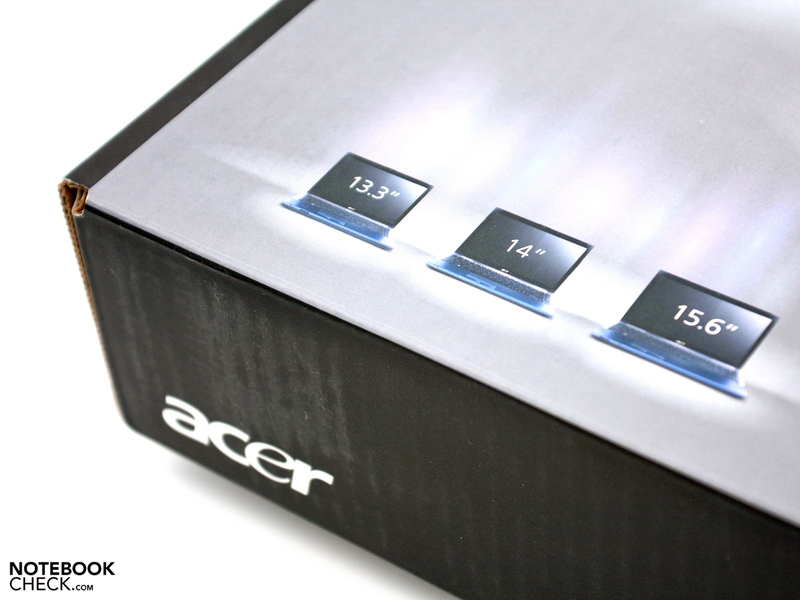 Sadly, Acer has no plans for launching a docking port for this consumer oriented series. The communication modules are very good. The Gigabit Ethernet LAN and WLAN 802.11 b/g/n, which uses two controllers from Atheros, are on-board and so is the latest Bluetooth 3.0 +HS. This new technology is much faster than its predecessor, the version 2.1, and is supported by new smartphones already. 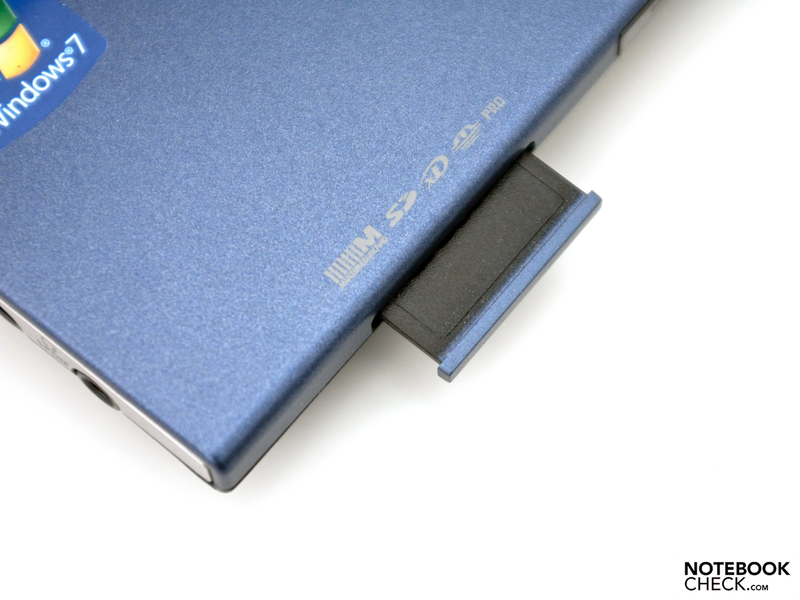 Under a small flap on the back, there is a dummy shaft for a SIM card. A version of the TimelineX 5830TG with integrated UMTS is not available yet on the Internet. The delivery package includes the usual advertisement for products from various manufacturers. The 90 watt power adapter and various manuals can be found next to the device in the package. Acer also offers a few extra accessories via its Acer Store, but we also recommend taking a look at third-party suppliers. The installed software can be a problem for users. Microsoft Office 2010 Starter and various freeware programs are installed on the notebook. In addition, the usual test version of an anti-virus program is also installed alongside. We recommend using the programs which are needed and removing the rest of the bloatware (unnecessary software). The standard warranty for the new laptops has a life of 24 months including "Pick-Up and Return" service and 12 months International Travellers Warranty (ITW). This warranty is very good, and can be further improved: for a premium, the guarantee can be extended to 36 or 48 months with a variety of other extensions. The prices for this service range between 79 and 179 Euro and are, thus, affordable. Acer has switched from the previously used FineTip Floating keyboard to a new Isolation keyboard which uses single keys. 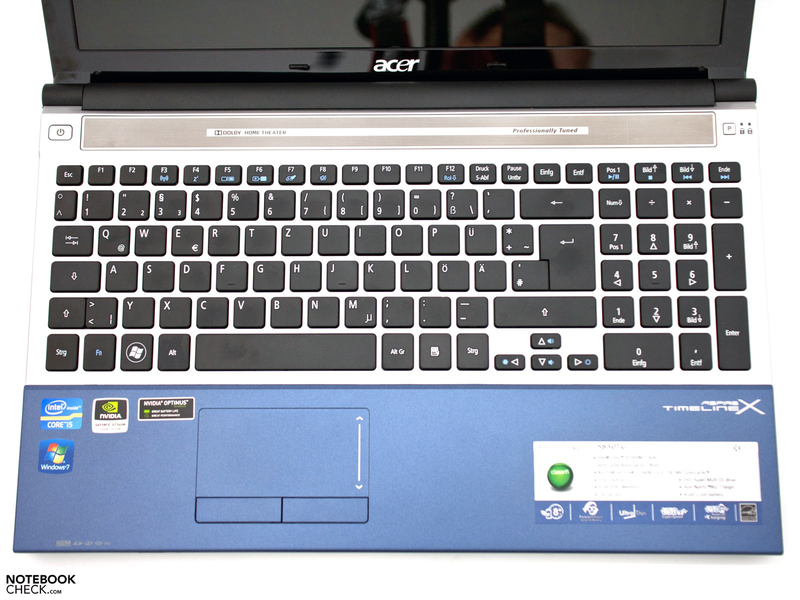 This keyboard is well-known from the premium Aspire Ethos series from Acer. The two key pairs placed together are new but their function remains a mystery. The comfortable pressure point and low noise emission are impressive, but the stroke distance should have been shorter. The separate numeric keypad is a nice feature, but the smaller models have to work without it as they lack the space for it. 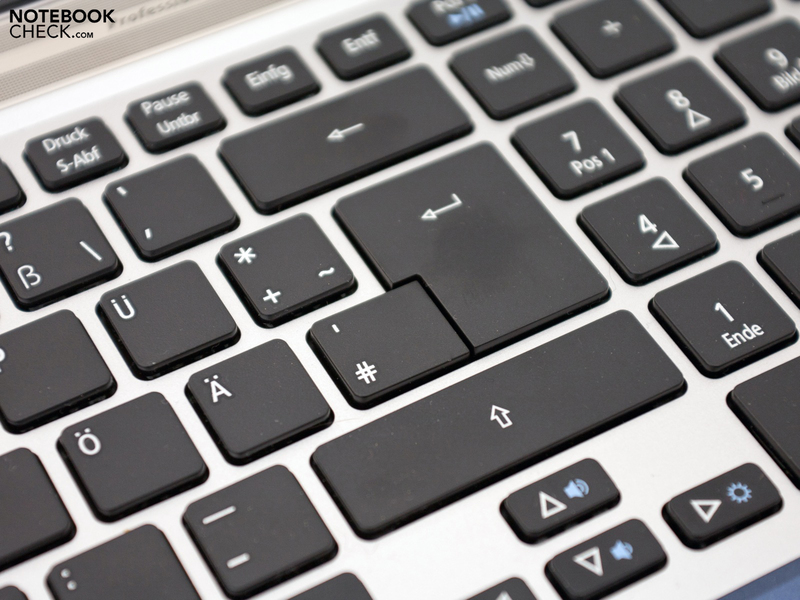 The cursor keys seem rather small compared to the rest of the keys, and gamers might find them hard to use. 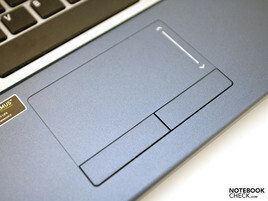 The optics of the touchpad have changed, but the model still uses the Synaptics Multitouch Pad V7.2. Multiple finger gestures, as well as a horizontal and vertical scrolling bar are available (both are active by default). The matt surface is the same colour as the device and allows for precise and quick navigation. The separate mouse keys under the touchpad are a nice new feature. Their pressure point is crisp and the stroke distance is comfortable. Acer has definitely improved its models in this area. "Cutting costs" is the best way to describe the quality of the display. The 15.6 inch display has a native resolution of 1366 x 768 pixels (WXGA, 16:9 format) and the surface is reflecting. Many buyers of the previous models criticised this display and wished for a panel with better quality. Unfortunately, their complaints were not heeded and higher resolutions or an extra panel are not available. Thankfully, the video output via VGA or the modern HDMI port(1.4a support) allow the use of external displays with higher resolutions. The quality of the displayed output leaves no room for criticism. The panel from AUO (Type: AUO B156XW04 V5 – AUO45EC) uses LEDs which deliver a maximum brightness of 179 cd/m² (modest). The average value of 171,1 cd/m² is commonplace and lies in the middle of comparable consumer notebooks. 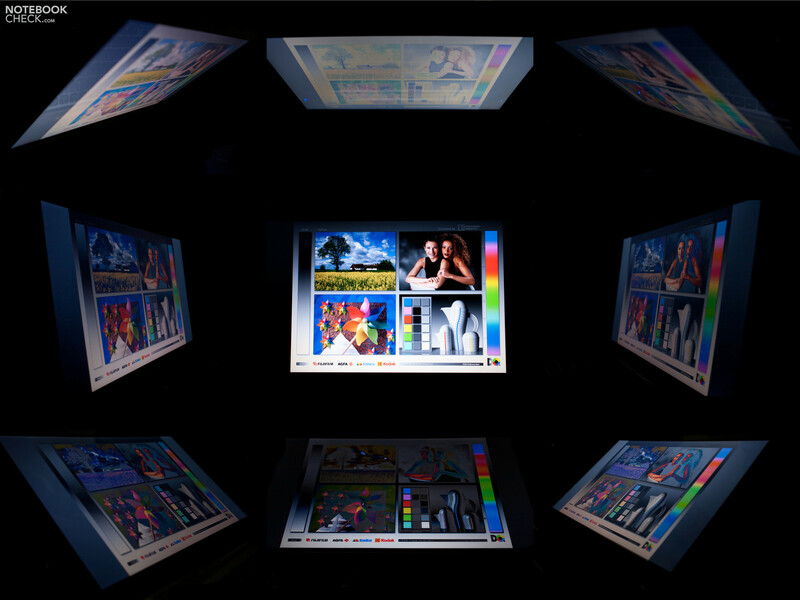 One positive feature is the even illumination on the entire display surface of 88%. 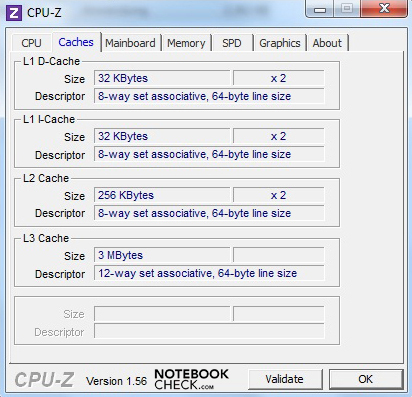 The contrast of 147:1 lies under the average and is typical to office and multimedia notebooks without special displays. A higher contrast value would have been very useful for the playback of films, viewing and editing of photos and playing games. The displayed colour space (ICC comparison) is poor like the display values. This panel was not designed for professional photo editing. However, it is also true that high quality panels are rarely found in the price class of the 5830TG, and even when they are offered, they can only be installed for a significant premium. Summer is coming closer, which also means that there will be many chances for visits to an open-air pub. Due to the low illumination and average display values, the Acer Aspire TimelineX 5830TG should stay at home on the desk. In a dark spot, the screen gives off strong reflections, and the reflective display bordering does nothing to prevent this. 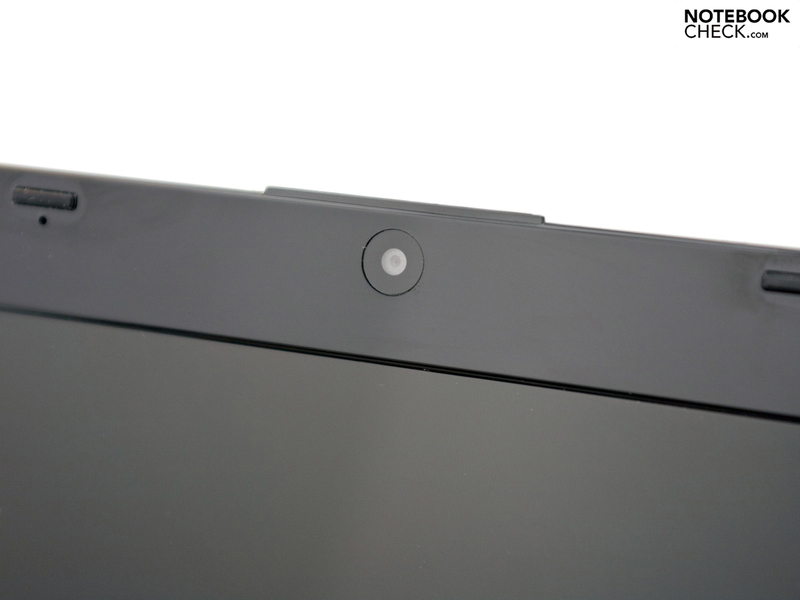 The viewing angle stability is similar to that of a cheap panel. The horizontal playback remains stable at flat angles up to 135 degrees. The vertical has to deal with more severe problems. A small change can cause a sudden inverting or fading of the displayed picture. All-in-all, not the best display one could hope for. The latest hardware is installed under the keyboard of the new models. Acer is using hardware from Intels new Huron River platform. 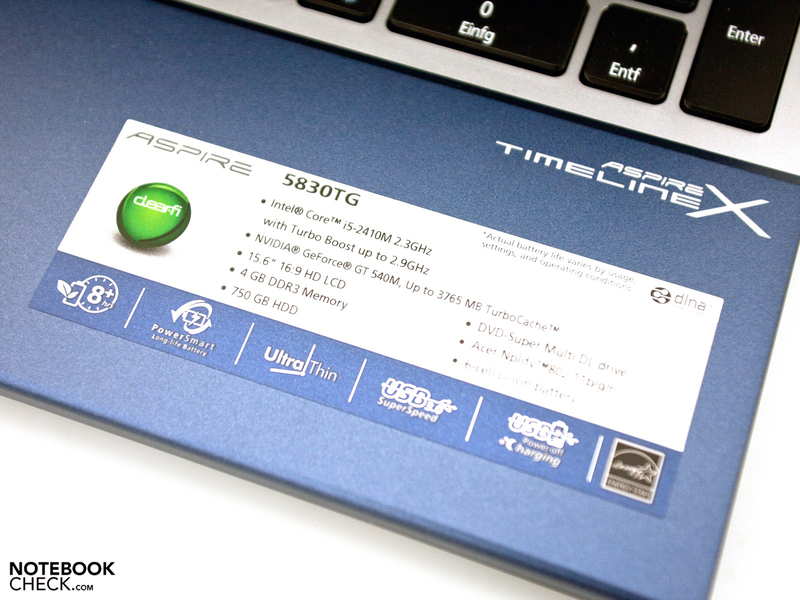 The Aspire TimelineX 5830TG is available in three versions, which, depending on price and demand, are equipped with either a Intel Core i3-2310M (2.1 GHz, 3 MB L3 cache), a Intel Core i5-2410M or a Intel Core i7-2620M dual-core CPU(2.7 – 3.4 GHz, 4 MB L3 cache). The i5 processor, tested by us, has a clock frequency of 2.3 GHz which is in the middle of the new portfolio of processors, and as all the other Sandy Bridge CPUs, it offers more performance than its predecessor. Thanks to the intelligent Turbo Boost 2.0 technology, the user can benefit from maximum performance and good average values from the CPU. 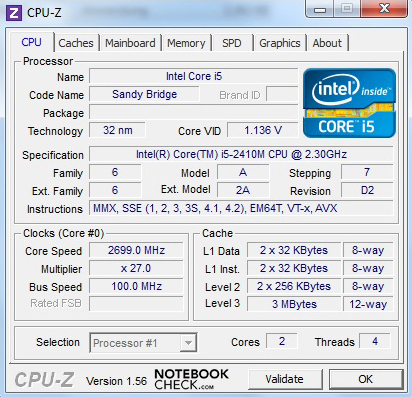 The clock range of the Intel Core i5-2410M ranges between 800 MHz (Energy Saver) and 2.9 GHz when overclocked. An additional feature, which supports multi-tasking, is the Hyper Threading technology. This technology allows the addition of two virtual cores to the two physical cores (2 cores, 4 threads). The entry-level CPU i3-2310M supports this feature but has to give up on the Turbo Boost feature. Installed next to the heart of the new laptops is the middle class GPU, the Nvidia GeForce GT 540M (based on the GF108 core). Thanks to the 2 GB DDR3 memory, 96 pipelines and a core clock speed of 672 MHz, the graphics chip could deliver great performance in various games. The Nvidia Optimus technology is used to achieve the best possible balance between run time and performance. This technology checks to see how much performance a certain task needs, and depending on the result, it switches between the CPU graphics and the dedicated graphics chip from Nvidia. The Intel Core i5-2410M CPU, can be found in a variety of notebooks, and is a good CPU for multimedia enthusiasts. The processor scores well in the Cinebench R10 (64-bit multi thread rendering) with a score of 7962 points, but is left behind by the predecessor model, the 5820TG (i5-460M), which scored 8342 points (4.6 % more). The Intel Core i7-2620M, which is installed in the Schenker XMG A501, and is available for a premium for the 5830TG (LX.RHK02.044), scored 11279 points and offers 29.4 percent more performance. One glance at our database reveals that the Intel Core i5 is in a good position in the upper middle class. 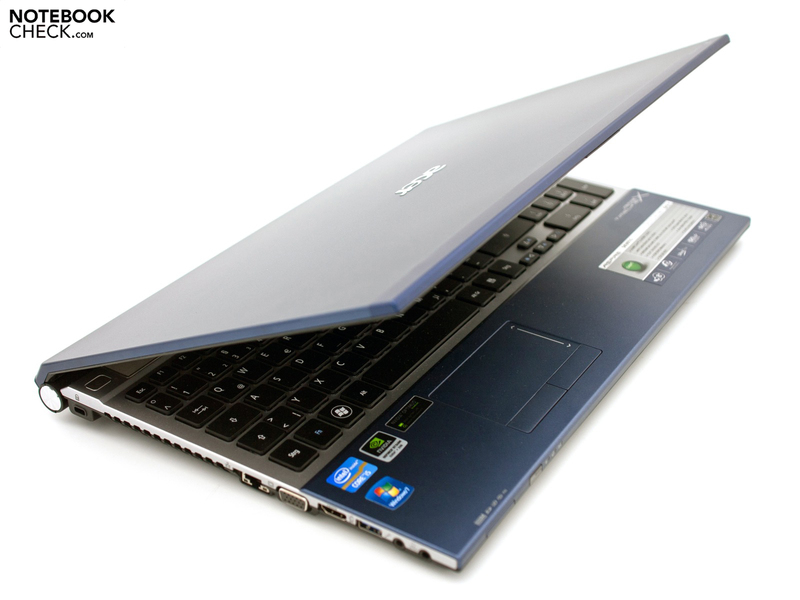 Comparable devices are Asus K53SV, Dell XPS 15 or the Medion Akoya P6631. In the latest CineBench R11.5 CPU benchmark, the CPU of the notebook scored 2.59 points and places among the top models of our database. 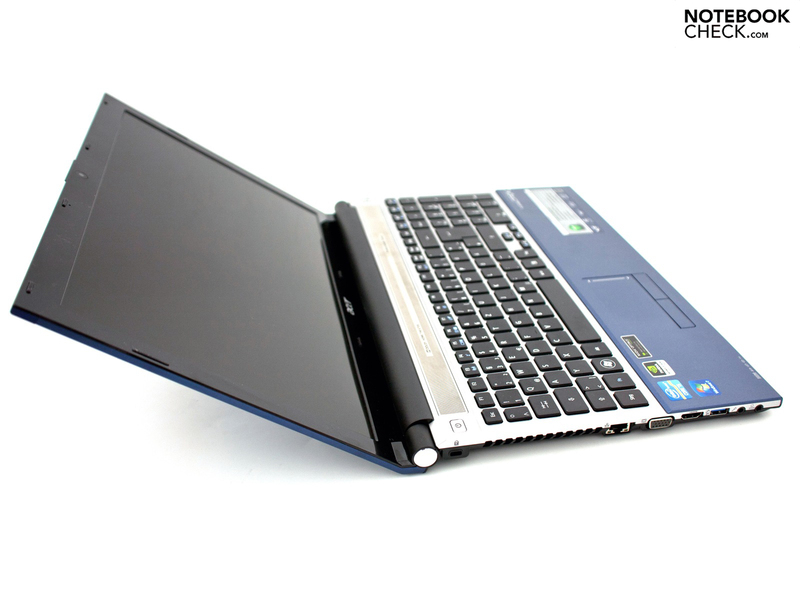 The Aspire 5820TG does not manage to keep up in this test, and loses to its successor with a score of 2.2 points which is roughly 15 percent less. The Intel Core i7-2620M is the stronger CPU, but it manages to barely score higher, with a score of 2.9 points (+ 10.7 percent). 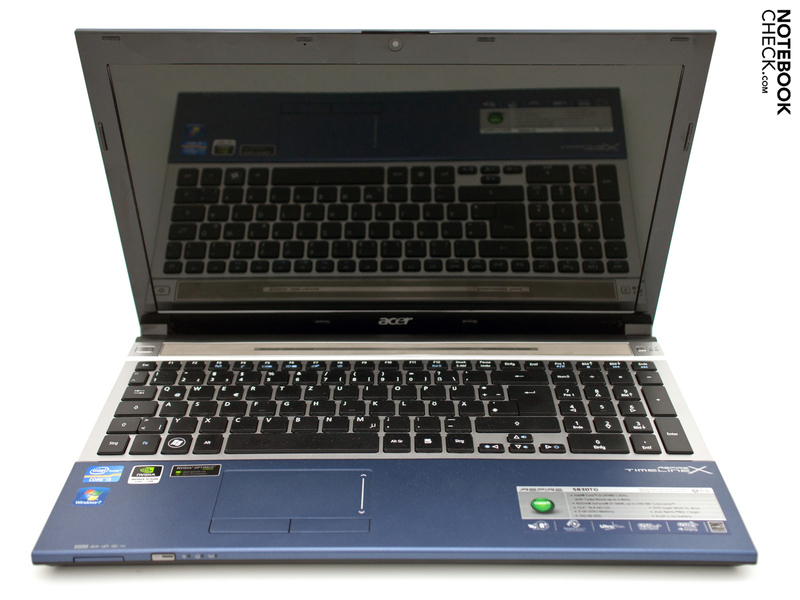 The laptop offers the Nvidia GeForce GT 540M for multimedia programs. In the 3DMark 06 by Futuremark, the test GPU scored an acceptable 7854 points. The smaller Acer Aspire TimelineX 4830TG, the Schenker XMG A501 and the Dell XPS 15 are laptops which offer similar graphics performance. The predecessor of the 5830TG, the 5820TG with an Intel Core i5-460M and AMD Mobility Radeon HD 5650 graphics chip, scored 6903 points (- 12.1%). A higher performance laptop would be the Asus N53SN with GT 550M and quad-core CPU. This model manages to score 8817 points (+ 10.7%). The latest 3DMark 11 benchmark is specially designed for GPUs with DirectX 11 support. Our test model scored 984 points (well enough to place in the middle class for overall rating). The 5820TG could not be tested as it does not support DX 11. Other graphics chips scored higher: the Nvidia GeForce GT 550M (+ 11.1%, 1107 points) and the AMD Radeon HD 6770M (+ 33.6%, 1481 points). We used the PCMark Vantage benchmark to create an overview of the notebooks and their performances. The 5830TG-2414G75Mnbb places itself in the upper middle-class with a score of 6632 points. Right next to it are laptops with the Intel Core i7-2630QM quad-core CPU, but also a few devices with older hardware. 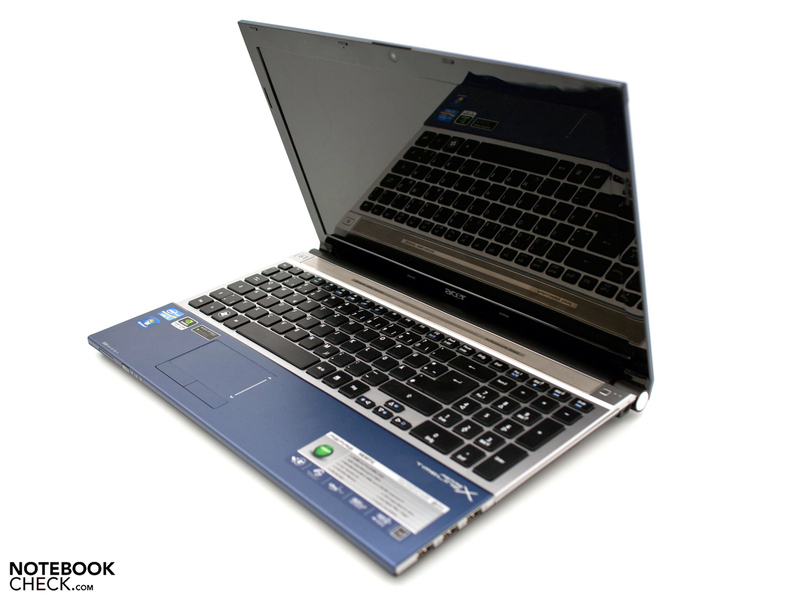 Higher ranking laptops had more to offer, such as the Schenker XMG A501 with an Intel Core i7-2620M CPU and GT 540M graphics chip, scored better thanks to its modern SSD (Solid State Drive). Acer has installed a 2.5-inch hard disk from Western Digital with a storage space of 750 GB in the 5830TG. 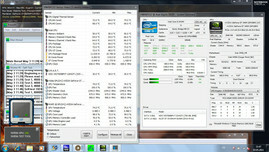 The Scorpio Blue (Type: WDC WD7500BPVT-22HXZT1) runs at 5400 rpm and showed average performance in the benchmarks. The maximum data transfer rate varied between 92 and 100 MB/s depending on the test which was being run. The data access times are average. The poor performance during 4K-operations will be bad in everyday use. 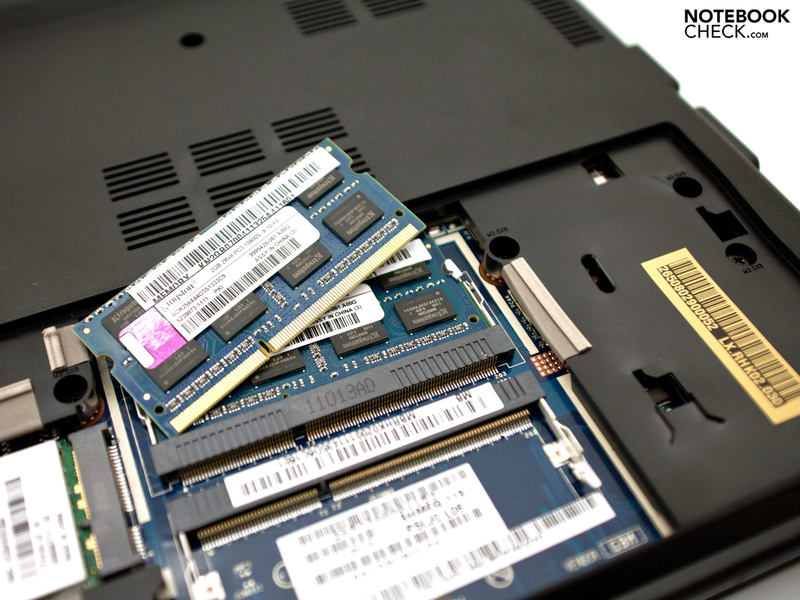 The installation of a hybrid hard disk (SSH) or a Solid State Drive (SSD) can be done quickly. Every notebook must endure stress tests (from Prime95 and Furmark) in our testing. After a short while, due to both stress tests as well as the Furmark alone, the laptop restricted the CPU speed at 1.2 GHz. 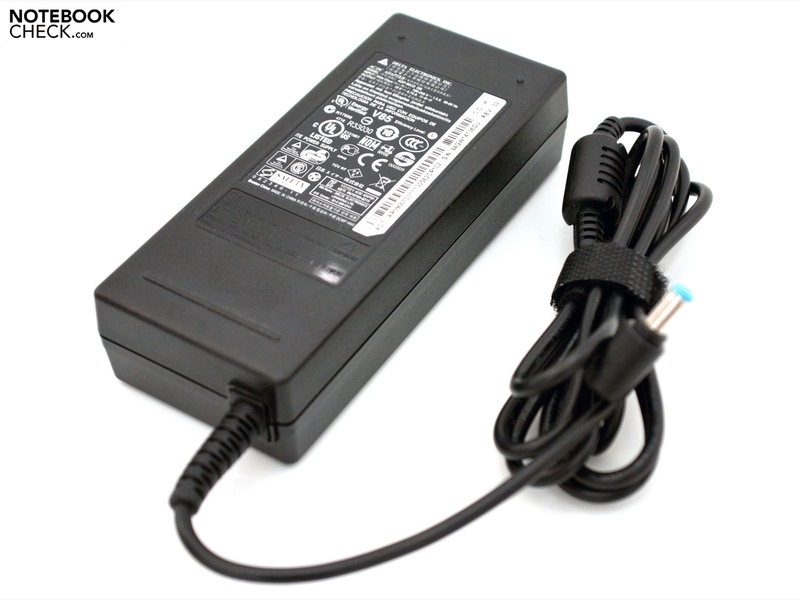 The power adapter has enough performance to provide for any scenario and the temperatures soon fall after reaching a high point. 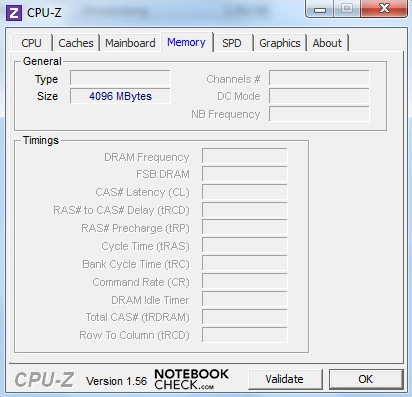 However, despite all this the CPU is still throttled down to 1.2 GHz and only after the active programs are exited, and the notebook has reached a certain temperature level, does the Turbo Boost reactivate and bring the CPU back up to 2.9 GHz (Multiplier: 29x). The topic of throttling is important in everyday use of programs and games, as the stress test depict a fairly unrealistic scenario. In the CineBench CPU benchmark, there were no negative changes recorded after various repetitions of the test. Even in the high performance Battlefield: Bad Company 2, the laptop performed fine at first. However, by the time we repeated the benchmark, the temperature had risen enough for the laptop to automatically restrict the CPU speed to 1.2 GHz. 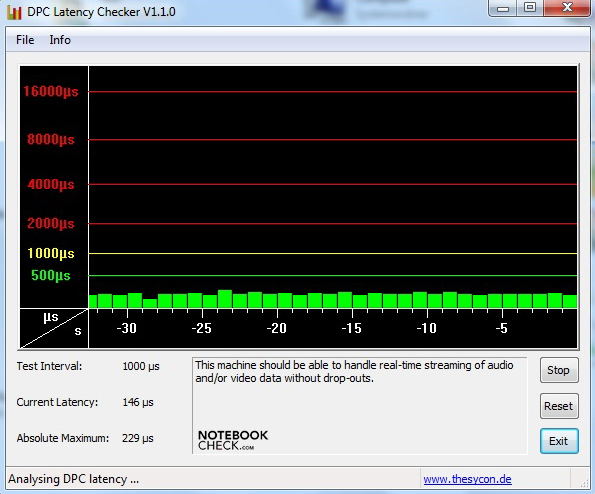 This throttling leads to a fps of 26.8 with high settings (1366 x 768 pixels, High, HBAO on, 4x MSAA). 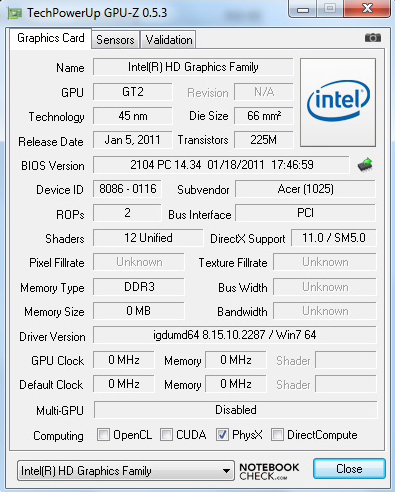 A look at the database of the GT 540M shows that the graphics chip provides on average 30 fps in this benchmark. The difference is small but, depending on the game, it can affect the playability. The GT 540M usually performs well in modern games. However, Full-HD gaming is not possible, and usually the performance is only good enough for the native 1366 x 768 pixels. Why the Acer Aspire TimelineX 5830TG CPU throttling activates well before the maximum temperature is reached is not clear. However, it seems plausible that every manufacturer sets its own limits in the BIOS to spare the hardware. Unfortunately, buyers can not change these settings. 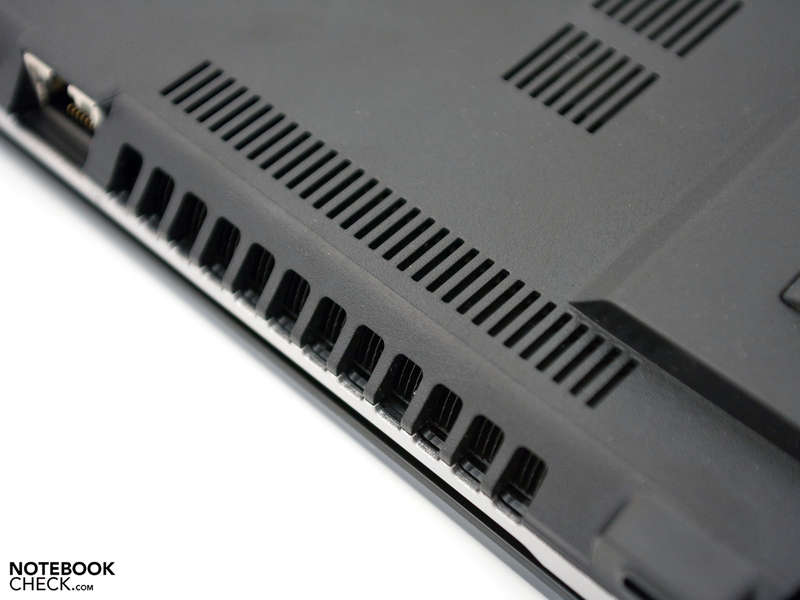 This condition raises many questions for users, such as, "how will the laptop react in the summer? ", or "What will happen when the high speed cooler fan gathers dust and fails to cool the system properly, thereby leading to a premature CPU throttling?" A query at Acer Germany led to the revelation that this problem has already been noted, and that technicians in Taiwan are already developing a solution for it. This problem should be resolved via an update. However, a fixed release date is not available yet. The new 5830TG is very quiet and would be a great companion for the office. Sometimes the cooler fan switches off which leads to noise emissions lying at a quiet 30.1 dB(A). The hard disk works quietly in the background and has an emission of 30.8 dB(A). All in all, the laptop is a good mobile device for work in the library or at the office. Under heavy usage, the laptop gets significantly louder. At its loudest, the noise emission lies at 41.6 dB(A). Thankfully the notebook stays constant at this level. A quick lowering of emissions is noticeable when the cooling system successfully manages to cool down the system. The new case has bigger and better ventilation openings. The cool office performance is also a big advantage. 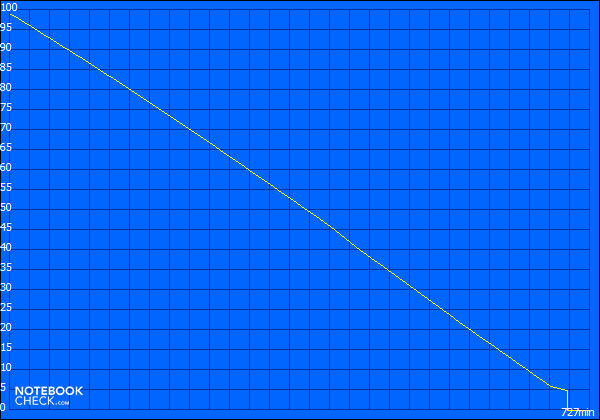 The temperature of the bottom and top sides lie in the blue regions of our image. At 26.9 degrees Celsius the synthetic material surface warms up slightly. Under heavy load, the temperatures rise clearly in our graphic, and are also subjectively tangible. 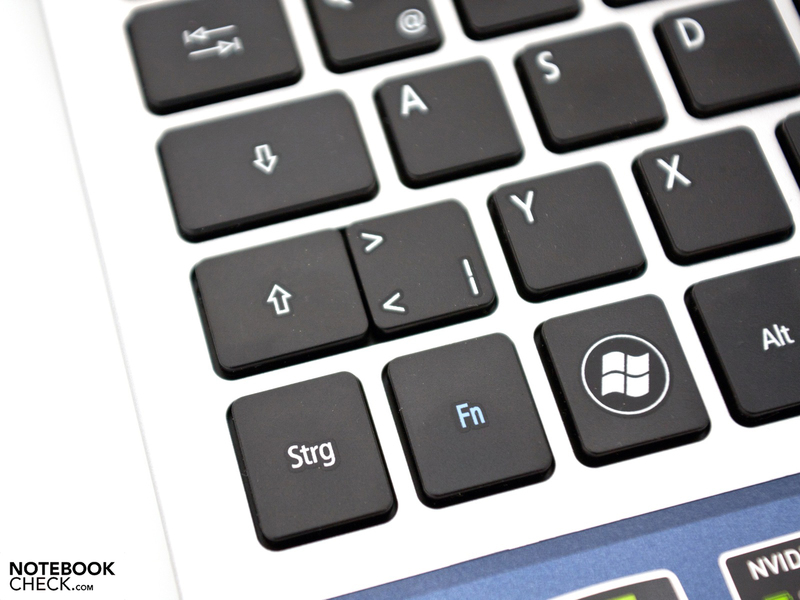 The ergonomical surface and the keyboard warm up at the peak of 39.7 degrees Celsius, but the keys remain cool. The ventilation openings can reach a temperature of up to 43 degrees Celsius. Overall a good performance, but working with the notebook on the lap might be problematic. A great feature is the fast cooler fan which quickly cools down the system after the work is done. 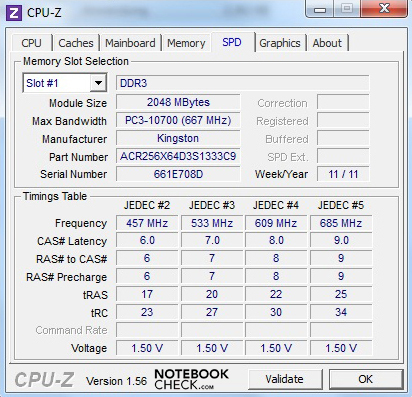 The cooling system has improved and the case temperatures are lower than in the predecessor model. (+) The maximum temperature on the upper side is 39.7 °C / 103 F, compared to the average of 36.5 °C / 98 F, ranging from 21.1 to 71 °C for the class Multimedia. 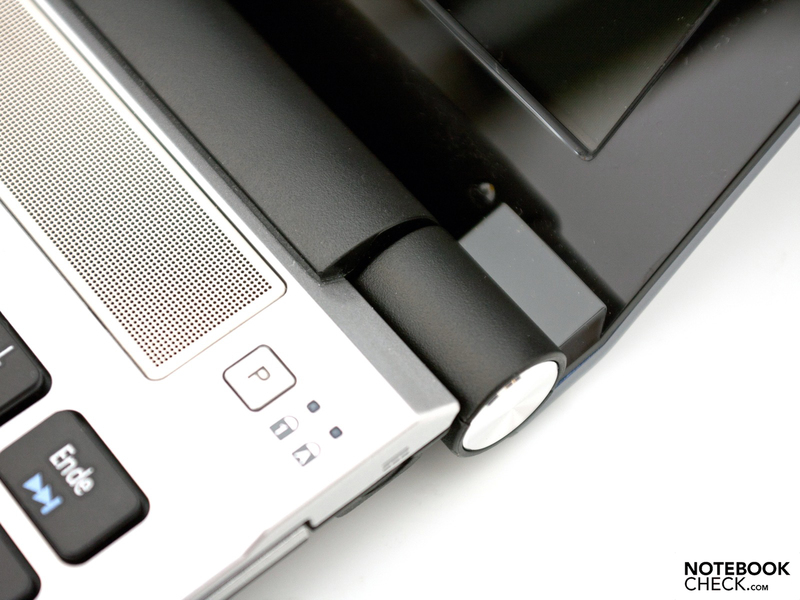 Two stereo speakers lie hidden under the stylish panel made of aluminium above the keyboard. The caption "Dolby Home Theater" and "Professional Tuned" hint towards the great sound quality offered by the speakers of this price class. We liked the sound quality in our first test. The sound spectrum seems balanced, while the bass playback remains well within limits. The maximum volume has the right level and the propensity towards brassy sound output is low. The positioning above the keyboard is a great choice too, as most notebooks place the speakers under the front of the device. Despite the fact that the speakers and the software are both good, audio enthusiasts are still advised to use external speakers. They can do this via the HDMI port or the headphone jack (3.5mm stereo), which allows the user to control analogue and digital devices over an optical cable (S/PDIF). The sound quality is impressive in all cases. The new Intel Sandy Bridge CPUs not only deliver more performance, but also save more power than the previous generation. 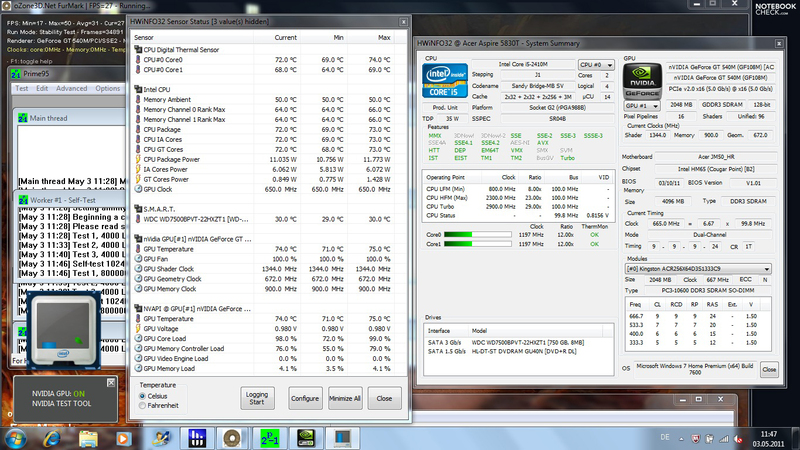 The Intel Core i5-2410M in out test model has a TDP value of 35 watts. In addition, the Nvidia Optimus and the Turbo Boost 2.0 technology also help save power. The activated processor GPU shows its strength in office use with a power usage between 6.4 and 8.7 W. This is slightly below the average power usage of other notebooks, and so a nice bonus. 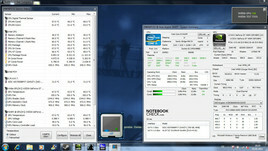 Under heavy load, the Nvidia GPU comes to life and the power usage jumps up to 75.2 watts, which is acceptable. The power adapter delivered alongside the laptop has no problems dealing with the maximum power usage, as it offers a performance of up to 90 W. When the laptop is in mobile use, the 6-cell Lithium-Ion battery with 66 Wh and 6000 mAh offers enough energy reserves. The biggest disadvantage of the new series is probably the securely integrated battery. This is still in the usual position (the back of the laptop) but can not be swapped out by the user. The Classic Test from Tool Battery Eater simulates the hardware load with activated Nvidia GeForce GT 540M. The minimum battery life was measured by switching on the WLAN, maximum brightness and the high performance profile. With this configuration, the Acer TimelineX 5830TG ran a total of 2 hours and 21 minutes. The opposite of this test is usually the Reader’s Test, in which we try to measure the maximum battery life. The notebook manages to score very well in this test thanks to the big battery, and low power usage. The laptop ran for 12 hours and 7 minutes with this configuration. 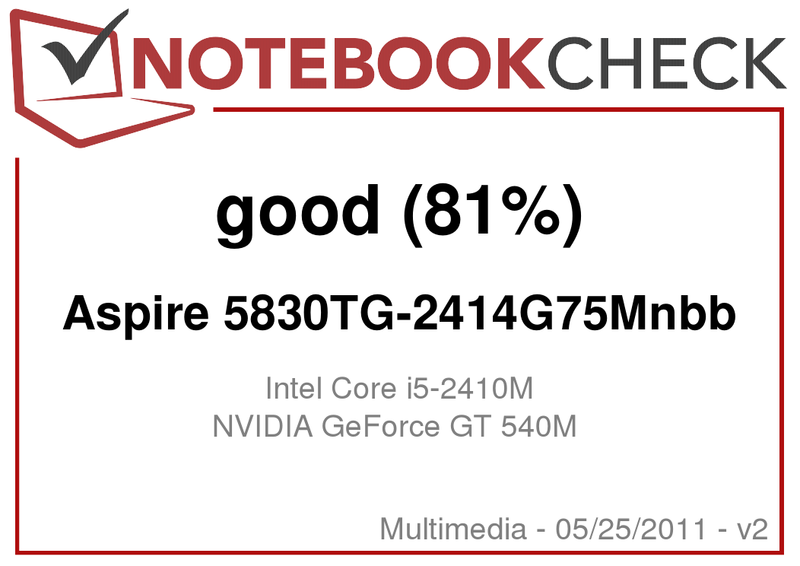 This impressive result sets a standard for other consumer notebooks. Nvidia Optimus graphics switching technology allows the user to profit from an ideal compromise between surfing on the Internet using the WLAN and watching DVDs. The battery life of 8 hours on average is satisfactory. 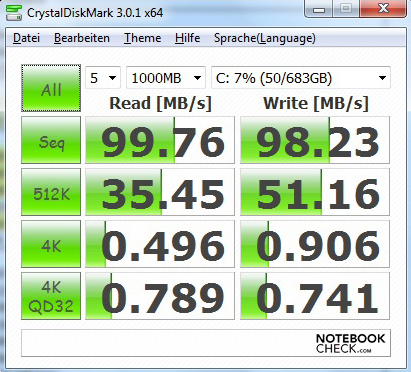 The Acer Aspire TimelineX 5830TG-2414G75Mnbb is a good first try at improving the TimelineX series. However, the new TimelineX generation is not flawless; the Aspire TimelineX 5830TG has new strengths and old weaknesses. The fresh and slim design, input devices and the latest ports gave us a positive impression. However, the case sturdiness and the modest, reflective display are two big weaknesses which still afflict the TimelineX series. 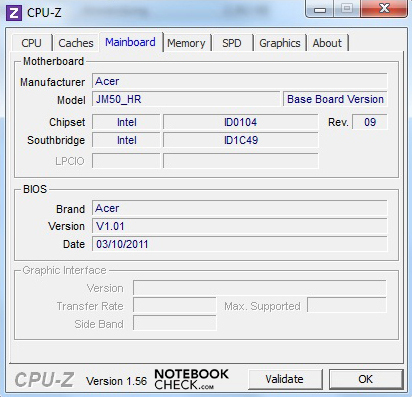 Acers decision to switch to the new Intel Core i5-2410M dual-core CPU and Nvidia GeForce GT 540M, the new dedicated graphics chip, allows the notebook to deliver a good deal of performance. The biggest criticism, besides the display, is the "Thermal Throttling" of the CPU at a relatively low temperature. Acer is trying to solve this problem for the buyers of the notebook. Additional positive features are: the improved cooling system (emissions), good speakers, and impressive battery life. The overall positive impression is damaged slightly by the integrated battery. Swapping out the battery is no longer possible. Overall a fresh new look for a brand new laptop. It has great performance and connectivity thanks to its latest hardware but it also has a few flaws. Still, a good package for multimedia enthusiasts for the current entry-level price of around 700 Euro with a 24 month guarantee. 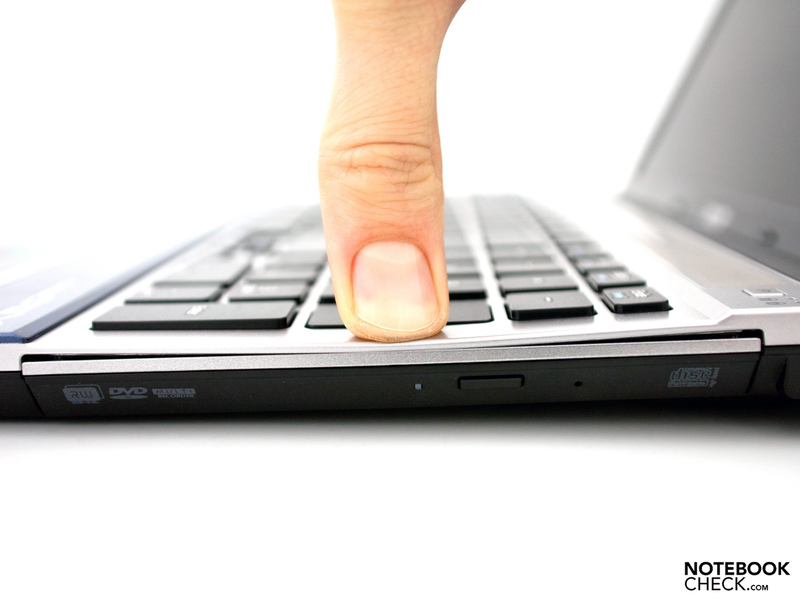 We tested the new Acer Aspire 5830TG TimlineX Notebook. The bigger, outwardly placed display hinges offer support for the display. The thin display cover is not very sturdy. The 1.3 megapixel webcam offers good video quality. Warm air goodbye - the ventilation openings are well-dimensioned. ... the 750 GB hard disk (2.5 inch) from Western Digital are installed. The obligatory SIM slide-in slot. 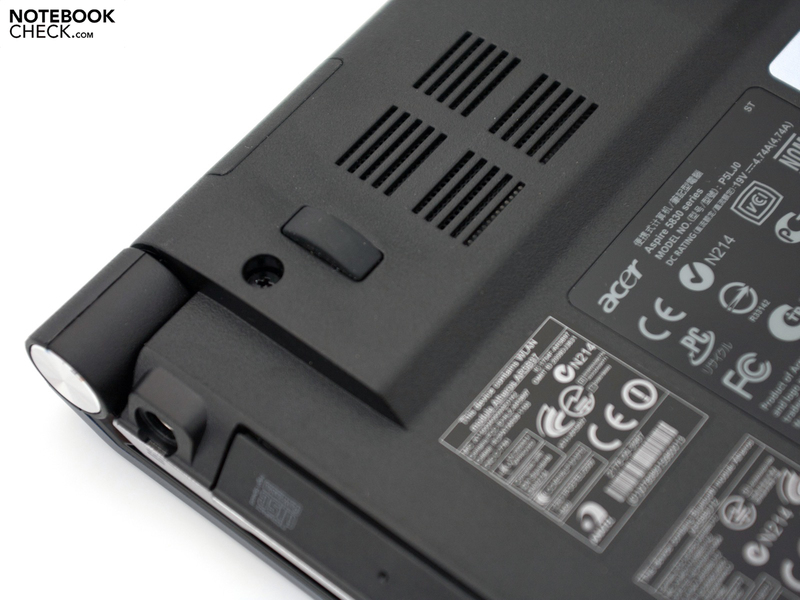 Acer has a new design for the integrated battery. 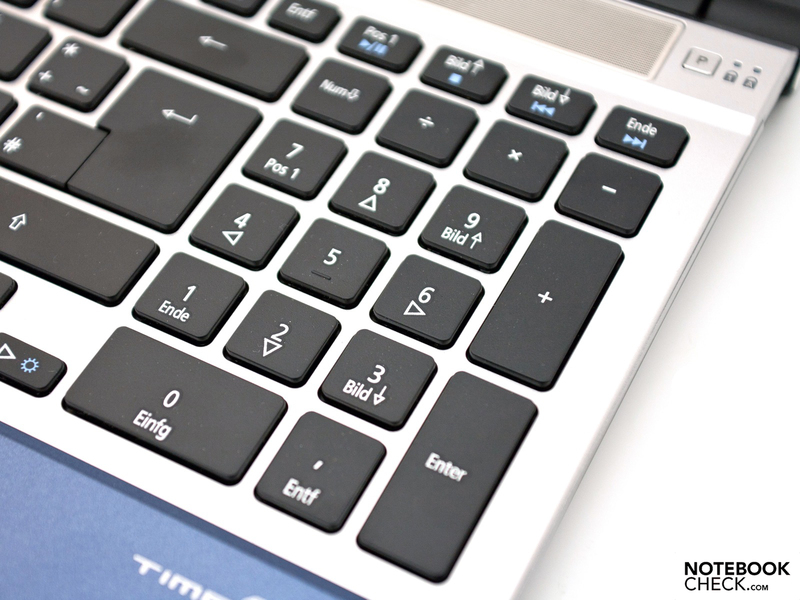 Only the 5830TG has a numeric keypad installed. The big layout in black and the typing feel are impressive. The new isolation keyboard originates from the Aspire Ethos series. This laptop is the spearhead of the new series with a display of 15.6 inches. 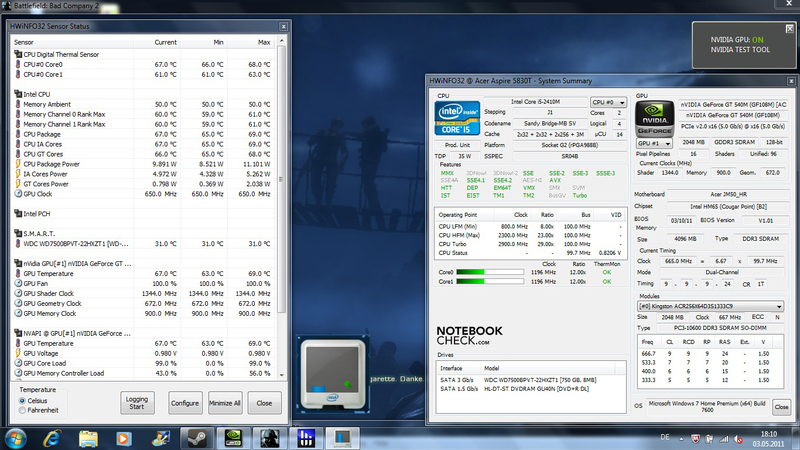 New hardware: Intel Core i5-2410M und GT 540M. The design has also been updated. The blue lacquer exterior has changed very little. The notebook looks fresh and modern on the inside. 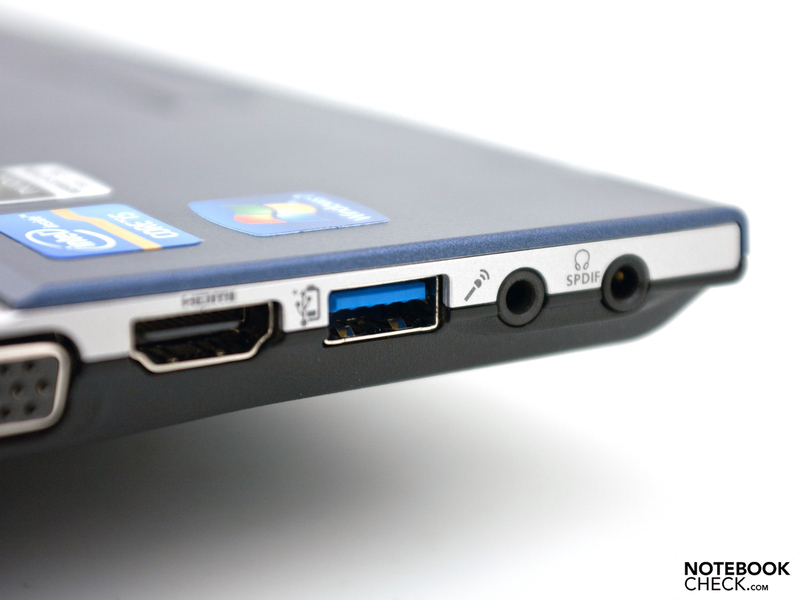 ... and, of course, the latest USB 3.0 port with the "Power-off Charging" feature. The multi-card reader in the front is also very useful. A battery charge display can be fond next to the status LEDs. Fast hardware, which is powered by a 90 watt power adapter. The new design fitting the TimelineX style, the new Isolation keyboard, the good battery life, and the low power usage. A slimmer Windows installation, better sturdiness in the area of the keyboard and even the display deserves better brightness/contrast. The CPU Thermal Throttling starts from a relatively low temperature. Acer hopes to improve this by updating the BIOS. 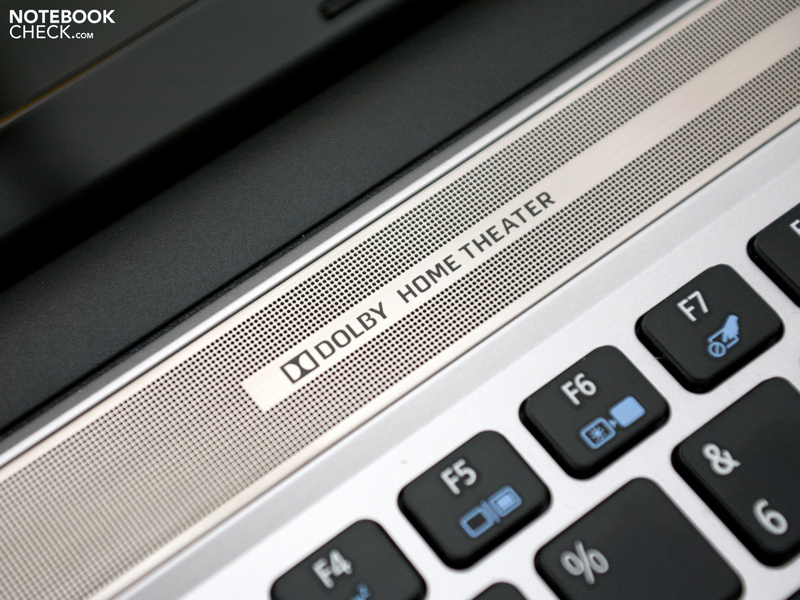 Mainstream multimedia notebooks with the latest hardware. These include: the Asus N53SN with GT 550M, the Dell XPS 15 with identical CPU and GPU, the Schenker XMG A501 with various configurations and the Aspire 5750G Consumer-Notebook from Acer.